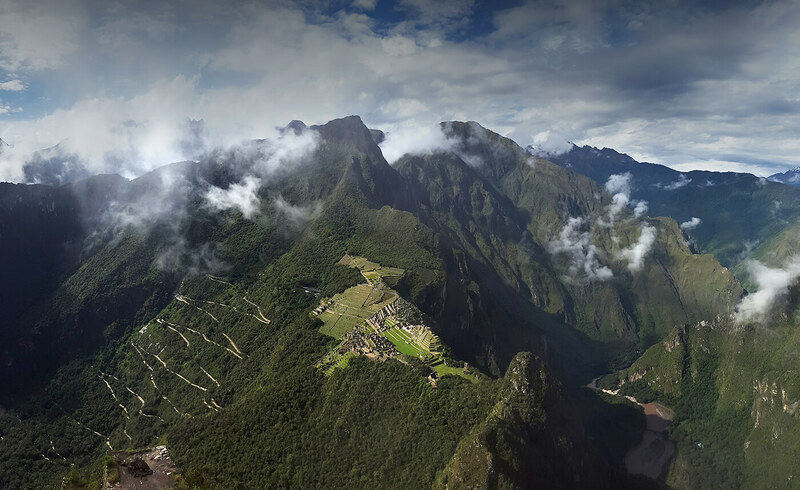 See the best of Peru on a whirlwind tour from the coast to the Andes and down to the Amazon. Begin in the vibrant capital of Lima and soak up Peru’s culture and gastronomy. Travel down the desert coastline to wonder at wildlife on the Ballestas Islands and ponder the mystery of the Nazca Lines from a low-flying aircraft. Enter the Andes: glimpse colonial treasures in Arequipa, observe the flight of the condor over the gaping valleys of the Colca Canyon, sail across one the world’s highest lakes, visit floating islands anchored by reeds, admire photogenic Inca ruins and Spanish churches in Cusco, and explore Machu Picchu, masterpiece of the Inca Empire. A trip to the Amazon is the only fitting end to this thrilling tour. From Puerto Maldonado, you’ll ride a motor boat to a jungle lodge and learn about the extraordinary biodiversity of the rainforest. Arrival at Lima airport. Meet our representative for a transfer to your hotel in Lima. Start exploring Lima at your leisure. Walk to the Malecon for Pacific ocean views along the promenade lined with beautiful parks and sculptures. You can also find a cafe at Parque Kennedy, visit the artisan market to get a preview of the crafts you’ll see for sale throughout your trip, or just relax in your hotel. In the afternoon, meet your guide for a tour of the city’s main attractions. You’ll start at Huaca Pucllana — the 4th century temple is one of the few visible remnants of Lima’s long pre-Columbian history, made all the more remarkable because it sits amid the city’s most modern high-rises. After a tour of the ruins, you’ll continue to the historic Plaza de Armas, where the “City of Kings" was founded by the Spanish conquistador Francisco Pizarro in 1535. Standing on the scenic plaza, your guide will explain the political, social, and architectural history of Peru as it intersects with Lima’s main square. Then you’ll continue to San Francisco Monastery, one of Peru’s most beautiful colonial complexes and home to extensive subterranean catacombs where more than 25,000 human bones rest in ghoulishly artful patterns. The last stop is at Larcomar, an open-air shopping and entertainment center built into the red-brown cliffs of the Lima coastline and an excellent place to see the sun plunge into the Pacific. In the evening, start your discovery of Peruvian cuisine at one of Lima’s many excellent restaurants before returning to your hotel for a good night’s sleep. Transfer to the bus station and enjoy the ride (about 3.5 hours) to Paracas. Check in to your Paracas hotel and transfer to the Pisco airport for a flight over the Nazca Lines. Built in three phases between 500 BC and 500 AD, the lines are massive drawings in the earth whose dimensions can only be appreciated from high above land. There are two types of geoglyphs: representational (animals, birds, flowers, and everyday objects) and geometric (straight lines, triangles, spirals). Your Nazca flight will provide you with a sampling of both and an opportunity to puzzle over the significance of this world historical site. Return to your hotel in the early afternoon. Enjoy a beautiful sunset over Paracas Bay. 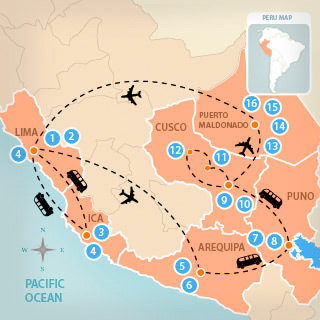 Note: Two passenger minimum for flights from Pisco to Nazca. Inquire for single passenger options. *Restrictions apply for passengers weighing 100 kg (220 lbs) or more. Please inquire for more information. Transfer to the dock and board a boat for a 2-hour tour to the Ballestas Islands, often called the “Poor Man’s Galapagos.” Sea lions, cormorants, boobies, and Humboldt penguins are among the most notable inhabitants of this protected marine reserve. When not feeding in the nutrient-rich coastal currents, colonies of birds and animals cacophonously populate every available inch of the rocky isles, making for fantastic photo opportunities On clear days, the boat tour also provides views of the Candelabra geoglyph etched onto a mountain slope. After the tour, transfer to the bus station for the ride back to Lima. Spend the evening at your leisure and rest up before your first stop in the Andes. Transfer to the airport for your flight to Arequipa, a city renowned for its delectable cuisine and its beautiful colonial architecture. Upon arrival at the airport, meet our representative for a transfer to your hotel. In the afternoon, meet your guide for a tour of Arequipa's highlights. The first stop, Iglesia de la Compañía de Jesus, exemplifies the city’s distinctive architectural heritage. The church exterior is a masterpiece of Andean baroque details sculpted from white sillar stone, while the interior displays a collection of paintings and wood carvings from the Cusco School of Art. The highlight is San Ignacio Chapel, the former sacristy, with a stunning dome and walls covered in multicolored murals depicting rainforest flora and fauna — an artifact of the Jesuits’ missionary efforts in the Amazon. Your next stop is the Plaza de Armas, where the elegant stone-sculpted facade of the Basilica Cathedral steals the spotlight. You’ll continue to Santa Catalina Monastery, where the Spanish colony’s wealthiest nuns once resided within a convent big enough to have its own streets and plazas. The final stop on this tour will be a mirador (lookout point), either Yanahuara or Carmen Alto, where you will be able to get pictures of Misti Volcano looming over the city. Enjoy dinner at one of Arequipa’s many fine restaurants; recommended dishes include rocoto relleno and chupe de camarones, two Arequipean specialities. Visit the Plaza de Armas for evening photos of the Cathedral. Then go back to your hotel for some rest before an early morning pickup tomorrow. Transfer by car from Arequipa to the Colca Canyon where you’ll spend the night. Keep your eyes open and your camera ready because the drive is among the most spectacular in the Andes. From Arequipa, you’ll gradually ascend to the highland plains and enter the Salinas and Aguada Blanca National Reserve, which includes the volcanoes Misti and Chachani within its borders as well as free-roaming herds of llamas, alpacas, vicuñas, and guanacos. You’ll reach Patapampa Pass at 15,300 feet (4,820 meters) above sea level before beginning the descent into Colca Canyon with breathtaking views of agricultural terraces along the way . Stop in the small town of Chivay for lunch, then drive to La Calera, where you can soak in the natural hot springs or simply enjoy the beautiful terraced landscape that surrounds you. In the afternoon, check-in to your Colca Canyon hotel for a relaxing night under the starlit Andean sky. Wake up early to go to Mirador Cruz del Condor, where you can spot condors soaring across the massive mountain landscape. You’ll drive about 40 minutes along a road flanked by soaring glacier-capped peaks: Mismi on one side and Sabancaya and Ampato on the other. (The headwaters of the Amazon River have been tracked to Mismi; while the Ice Maiden mummy was discovered following the 1990 eruption of Sabancaya). The viewing platform at Cruz del Condor stands 3,960 feet (1,200 m) above the canyon floor, providing mesmerizing views over into one of the world’s deepest valleys. Return to Chivay for lunch (not included), take some time to browse the local market, and then begin the overland journey to Puno (5 to 6 hours by car). Upon arrival in Puno, check-in to your Lake Titicaca hotel. Explore the city of Puno or find a spot to enjoy inspiring views over the lake. After breakfast, transfer to the bus station for the trip to Cusco. (As an alternative, inquire about flight and train options.) The comfortable tourist-class bus includes a stop for lunch and guided visits to archaeological sites along the way. Notable landmarks include La Raya Pass at 14,220 feet (4,335 meters), the monumental remains of the Temple of Viracocha at Raqchi, and the baroque style Andahuaylillas Church, nicknamed the Sistine Chapel of America for its interior frescos. Upon arrival in Cusco, meet our representative for a transfer to your hotel in the historic center and spend the rest of the evening at your leisure. After breakfast, transfer to the Cusco airport for the short flight to Puerto Maldonado. Upon arrival, meet our representative for a transfer by river boat to your Amazon lodge. Most lodges are located between 30 minutes to 1 hour by boat from Puerto Maldonado. As you leave the city behind, you’ll see the wide river open up before you, walled in by jungle growth on either side. Over the course of the next few days, you’ll learn more about rainforest and you’ll be able to add defining details to what at first glance seems like a vast green space. Upon arrival at your lodge, settle in to your cabana and then meet your guide to discuss the schedule of activities for the next few days. Enjoy dinner and then tuck in early. Your day tomorrow will begin at dawn. Specific activities vary by lodge and by season, but you’re guaranteed to be immersed in the rainforest of southern Peru. You’ll walk jungle trails to spot flora and fauna, hop aboard skiffs to spot wildlife in hidden lagoons, and witness sights and sounds unique to Peru's rainforest environment. Some lodges have tree canopy towers where you can see the rainforest from the perspective of a bird or monkey. You may also have an opportunity to visit indigenous communities and learn how they interact with the jungle environment. Night walks offer yet another angle on the Amazon, revealing critters that only emerge when the sun goes down. Enjoy a final breakfast at your lodge and then return by boat to Puerto Maldonado. Upon arrival at the port, you’ll be transferred to the airport to begin your journey home or on to your next destination.